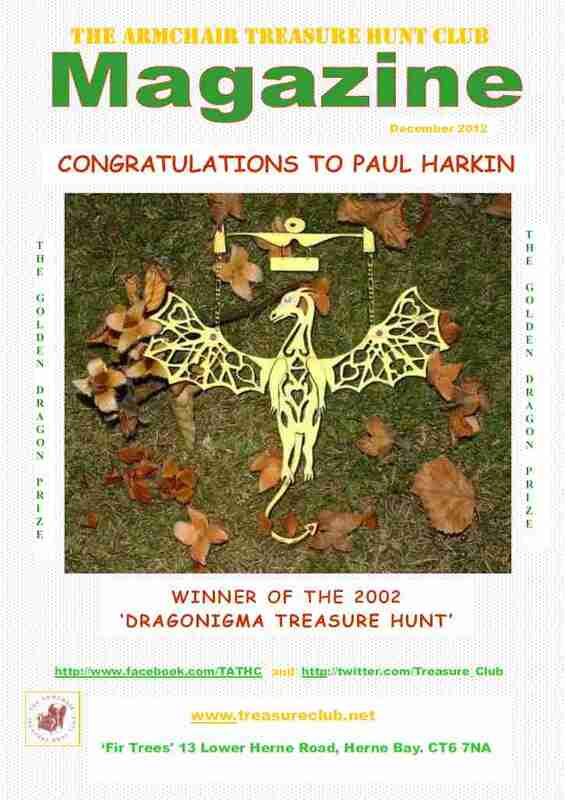 In March 1992 treasure hunt author Dan James, famous for his work in the art of illustrating and producing treasure hunt books, founded The Armchair Treasure Hunt Club and produced its first bimonthly club newsletter. This newsletter offered a challenge for people to pit their wits against each other, in the search for buried treasure, as in the long lost days of old, but this time the clues to the treasure could be solved from the comfort of your own armchair. For the cost of just £20 per year, members receive club treasure hunts and puzzles to solve, plus news from the treasure hunting world, within the pages of the club's newsletters. The first club treasure hunt (March 1992) was written and produced by Dan James himself was entitled A Timeless Moral. 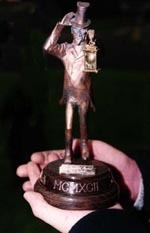 The prize, a statuette of the character within the story, Dr Emmanuel Worsfold, was crafted in bronze, and set on a rosewood base embellished with silver decorations, beaten, cut, and polished by hand. This treasure remained buried for three years, as people from all walks of life tried to solve the hidden clues within the story. Since A Timeless Moral, club hunts have come thick and fast - with at least one new major club hunt each year. Some club hunts remain unsolved and are open to new and current members alike. Most recently, A Monkish Plot offers a wooden chest of silver trinkets to the finder of a buried antique key. The newsletter itself is published four times a year, and provides many features for club members such as: the Letters Page, Crosswords, prize puzzles, a roundup of information on new or ongoing Treasure Hunts from around the world, member profiles, features on associated activities and hunts, plus the club hunts themselves of course. The Armchair Treasure Hunt Club has at least one club events each year, where members meet and exchange ideas on the hunt they are following. The venues for these events are spread around the country to give every club member a chance to attend, and meet like-minded people. The highlight of each event is a family-friendly one-day treasure hunt for buried treasure, which takes place in and around the chosen venue. The Armchair Treasure Hunt Club has now been in existence for over twenty years, and goes from strength to strength. Treasure hunting brings many hours of enjoyment as you search maps and books to try and uncover the elusive hidden spot where treasure lies buried - and there's the pure excitement and escapism as you delve into the realms of storytelling fantasies... of treasure islands, bleak moors, or dark shadowy glens. The pinnacle of which is being the first to solve and find your very own treasure. If you still dream of finding gold at the end of the rainbow, The Armchair Treasure Hunt Club is here to help you. Explore our website to find out more, and for details of how to join the club, click here. We hope to welcome you to the club soon!